New Technology to Dramatically Enhance Customer Experience – Including Wi-Fi, USB Charging Ports, and Digital Information Screens. 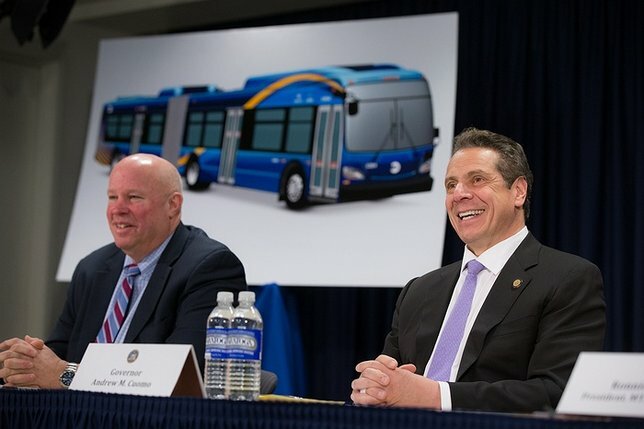 Governor Andrew M. Cuomo and MTA Chairman and CEO Thomas Prendergast (pictured left)yesterday at unveiling the plan to add 2,042 state-of-the-art new buses to its transportation fleet over the next five years. Photo by: Governor Cuomo's Office. New York, NY - March 8th, 2016 - Governor Andrew M. Cuomo today announced that the MTA would add 2,042 state-of-the-art new buses to its transportation fleet over the next five years. The Governor, joined by MTA Chairman and CEO Thomas Prendergast and MTA New York City Transit President Ronnie Hakim, introduced the next generation vehicles to the public, as well as previewed enhanced amenities like USB charging ports and Wi-Fi. 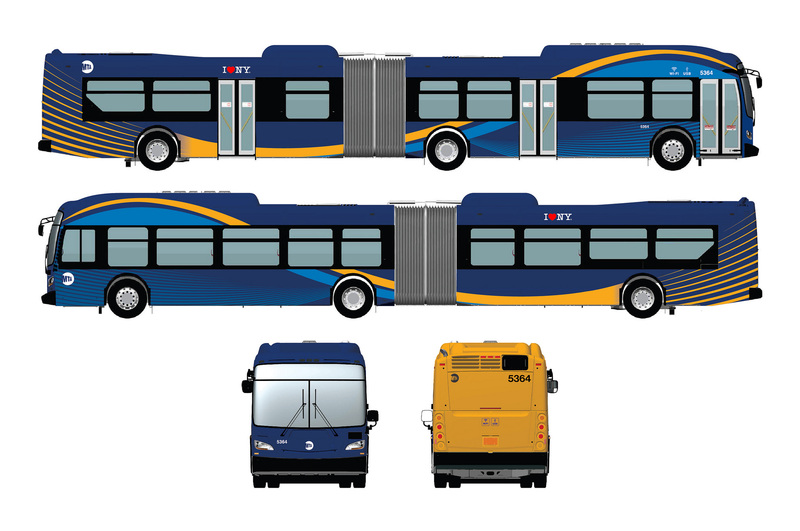 The new buses, which will replace nearly 40 percent of the MTA’s current fleet and represent a $1.3 billion investment of Capital Program resources, will begin hitting streets next month. 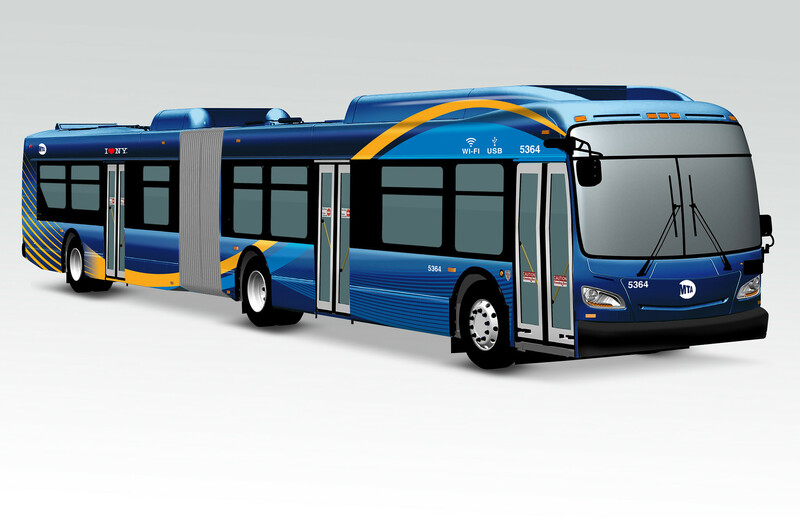 A rendering of the new state-of-the-art buses that will join the MTA NYC Bus Fleet over the next five years. By 2020, 2,042 buses will be equipped with Wi-Fi hotspots. Seventy-five of the first new buses will make their debut in the 2nd and 3rd quarter of this year in Queens, and over the next two years another 70 buses will begin operating in Brooklyn, 209 in the Bronx, and 18 in Manhattan. The remaining new buses will be assigned to various routes throughout the five boroughs from 2018 through 2020. Additionally, the MTA is in the process of upgrading existing busses with Wi-Fi and USB charging ports. By the end of 2017, all express buses will be retrofitted with Wi-Fi and USB charging ports. “Wireless connectivity is prevalent in the lives of our customers. More and more people are using Wi-Fi enabled devices such as smartphones, laptops, tablets and e-book readers on a daily basis and the MTA can accommodate this growing trend by introducing high-speed connectivity and charging ports on-board MTA buses," MTA Chairman and CEO Tom Prendergast said. Digital information screens will also provide customers with travel information to reduce anxiety about missing stops and better enable customers to plan and arrive at their destinations on time. Buses will have two to three LCD screens mounted inside the bus, displaying everything from automated stop announcements, available transfers at each stop, news, weather and advertising as well as real-time communication from the bus command center. Subject: LongIsland.com - Your Name sent you Article details of "Governor Cuomo Announces Significant Upgrade of MTA Bus Fleet, With More Than 2,000 New State-of-the-Art Buses to be Added Over Next 5 Years"